The HTC One (M8) features a slightly bigger battery than its predecessor (2,600mAh vs. 2,300mAh) and an Extreme Power Saving Mode. That’s only for when you really need to stretch the last few percent though, otherwise it would be a shame to limit the speedy Snapdragon 801 chipset. Note that for this test we didn’t use the power saving mode – we’re aiming to replicate regular daily usage and these modes limit the phone’s features and performance. The HTC One (M8) lasted for 20 hours of talk time on a 3G network, a massive improvement over the previous One. It also beats the Galaxy S4 (which also has a 2,600mAh battery) by a couple of hours. Unfortunately we don’t have numbers for the Galaxy S5 just yet. Things go the other way around in the web browsing test and the HTC One (M8) lags about an hour behind last year’s model, which was on par with the iPhone 5s. It’s still ahead of the Galax S4 by a couple of hours and matches the Galaxy Note 3 phablet. We guess the larger screen took a toll on the battery for the browser test, but it wasn’t the only consideration. The HTC One (M8) outlasts its predecessor by just over an hour, which might be the result of a more efficient video decoder. The standby power draw of the One (M8) is quite low, which coupled with good numbers from the other three test work out to a respectable endurance rating of 71 hours. That almost matches the Galaxy Note 3′s rating of 75 hours and phablets are supposed to compensate their extra bulk with bigger batteries. 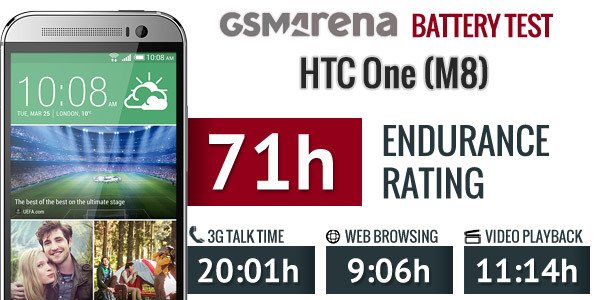 More impressively, the original HTC One scored only a 48 hour endurance rating. Again, we didn’t use the Extreme Power Saving Mode. With it, HTC promises that the last 20% of charge in the battery will last 60 hours. With three full days of medium usage, you’ll need to resort to that mode only when you forget to charge your One (M8) before leaving for your summer holiday. 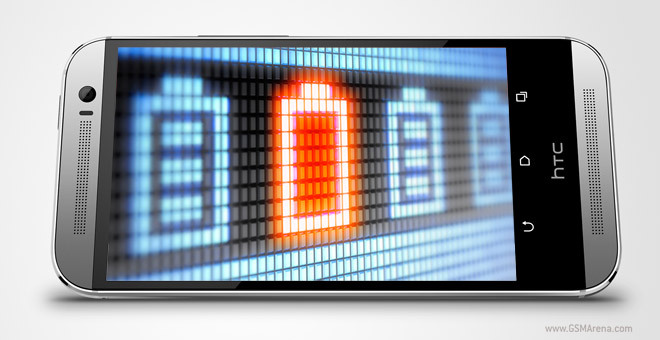 Speaking of, the phone supports Quick Charge 2.0 that charges the battery 75% faster. However, the charger included in the box supports only Quick Charge 1.0, which is “only” 40% faster than regular charging.